1. Cook the cauliflower and broccoli in boiling water for 5-6 minutes until tender, then drain in a colander. Add the sauce to the pan and cook for 1 minute. Stir the vegetables back into the sauce and transfer to a heatproof serving dish. 2. 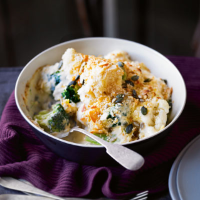 Mix together the seeds, almonds, breadcrumbs and cheese and sprinkle over the vegetables. Place under a preheated grill for 2-3 minutes until golden.